April 6, 2015 marks the City of Vancouver’s 129th birthday. To celebrate all that our city has accomplished, we’ve dived into Vancouver history and found the biggest events, transformations and milestones that have made a lasting impact on Vancouver’s development as a world-class city. April 6, 1886: the Town of Granville is incorporated as the City of Vancouver with a population of 1,000 residents. The name is chosen partly because Easterners from Toronto and Montreal had heard of Vancouver Island, but had never heard of “Granville”. View of “downtown” Vancouver along Hastings Road in 1886. 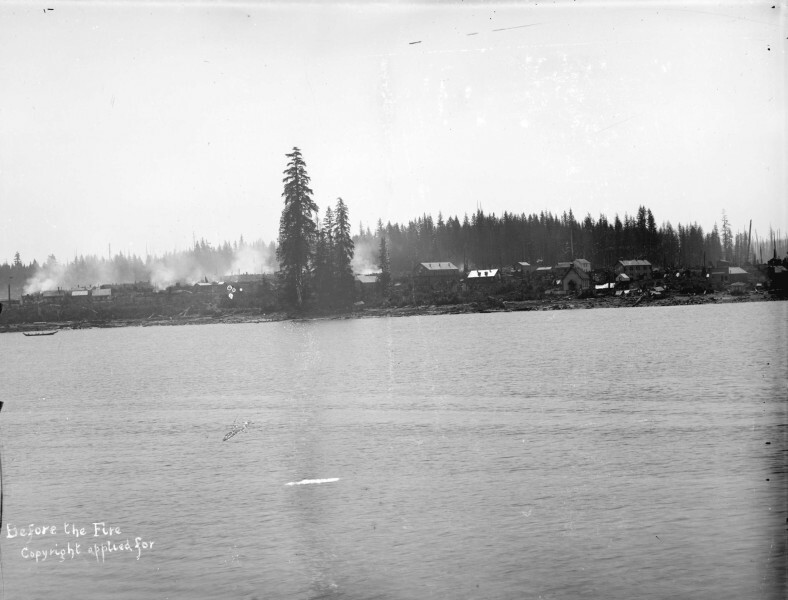 June 13, 1886: Just two months after the City was officially born, the Great Vancouver Fire destroys most of the city in a mere 25 minutes. 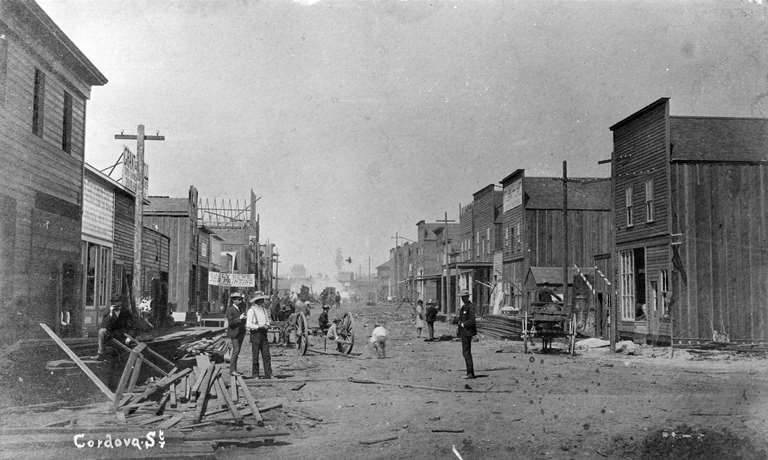 Rebuilding Cordova Street in the summer of 1886. Summer, 1886: The Canadian Pacific Railway builds its terminus in Gastown and trips from the East Coast begin in the summer of 1886. The terminus of the Canadian Pacific Railway in 1889. September 27, 1888: Stanley Park opens. 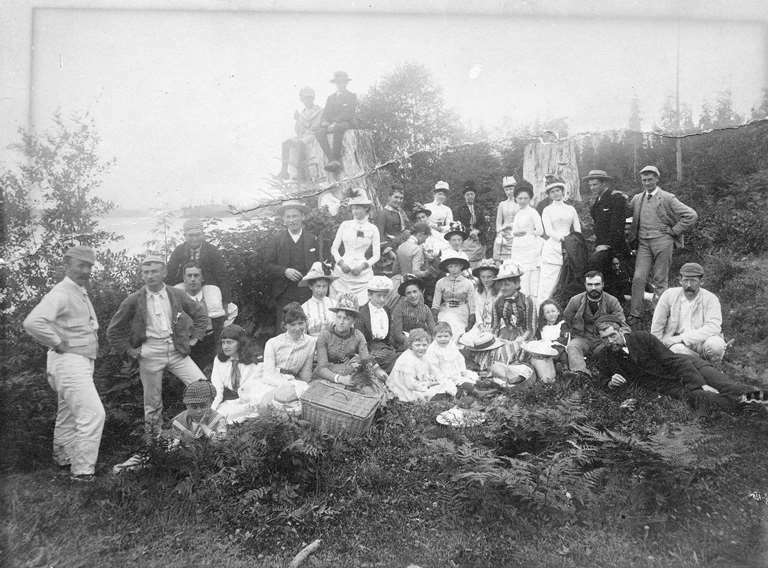 A picnic in newly opened Stanley Park in 1888. 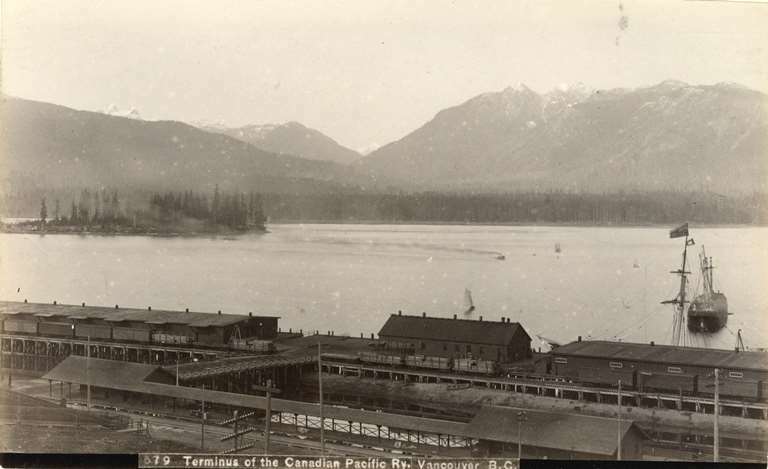 1890’s: With a rapidly growing population of 14,000 people, Vancouver experiences a huge boom as the Klondike Gold Rush brings people and trade through the city’s ports. As well, technology and transportation become more sophisticated with the arrival of electric streetcars, the CPR’s Empress line of ocean liners and pay telephones. 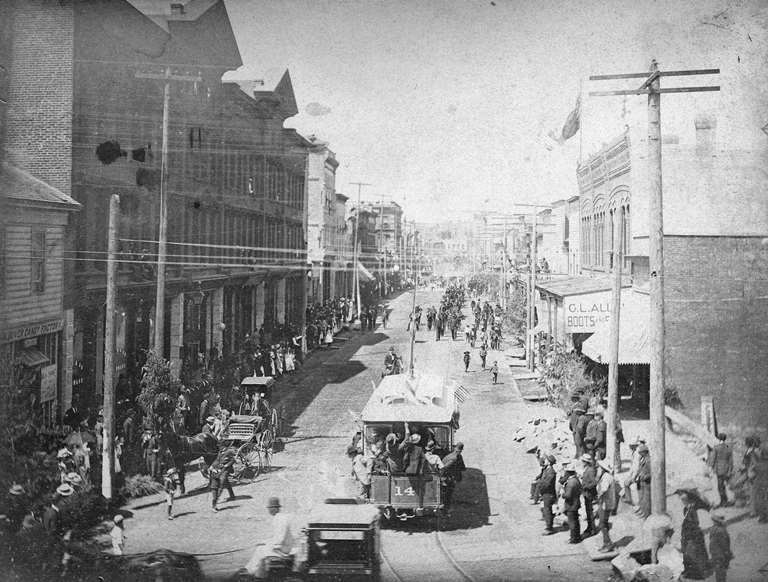 A Canada Day celebration looking west from Carrall Street on Cordova Street in 1890. October 15, 1898: The now-historic 9 o’clock gun is placed at Brockton Point in Stanley Park and fires for the first time. 1906: Vancouver’s population reaches 50,000 people and the Vancouver Court House, now Vancouver Art Gallery, is built. 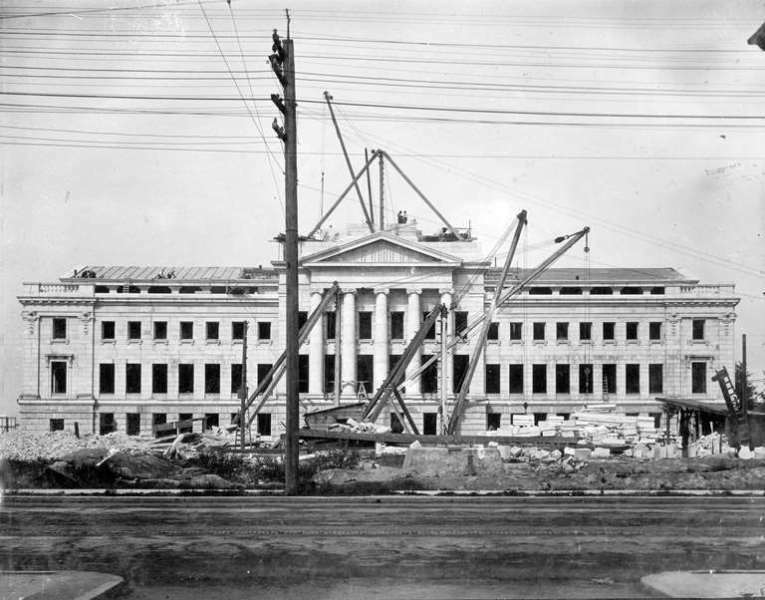 The Vancouver Court House under construction in 1907. 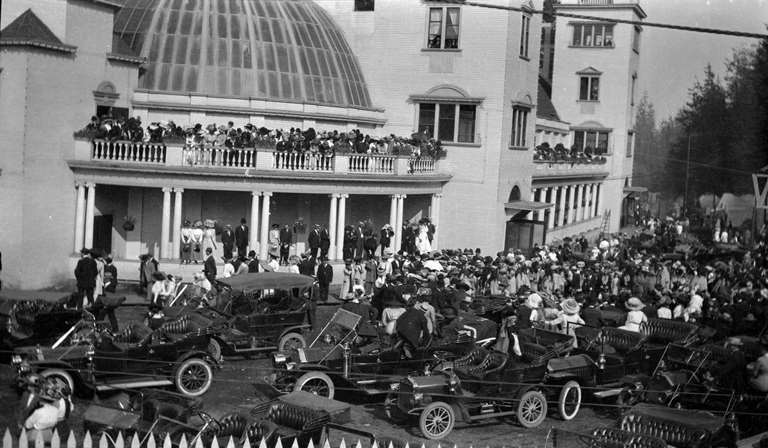 Summer, 1910: The first Pacific National Exhibition is built at Hastings Park and is opened by Prime Minister Sir Wilfred Laurier. Crowds assemble at Hastings Park for the first Vancouver Exhibition. May 23, 1914: The Komagata Maru arrives in Vancouver after sailing from Hong Kong, Shanghai and Yokohama with 376 Sikh, Muslim and Hindu passengers. The ship is turned away at port due to anti-Asian immigration controls and causes an uproar in the Indo-Canadian community. The ship eventually leaves the harbour to return to India in July with all but 20 passengers on board. 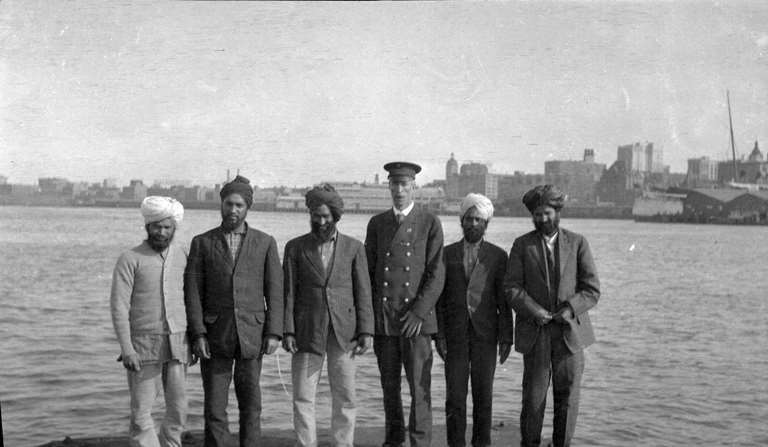 Passengers from the Komagata Maru stand with an official in the harbour. August 2, 1917: The Vancouver General Strike begins as the first general strike in Canadian history. The strike protests war drafting and the killing of draft-evader Albert Goodwin. The underlying resentment that fuels the strike is the realization that capitalists profited from the First World War at the expense of labourists and soldiers. 1925: The University of British Columbia moves from its Fairview location to a new permanent home in Point Grey. 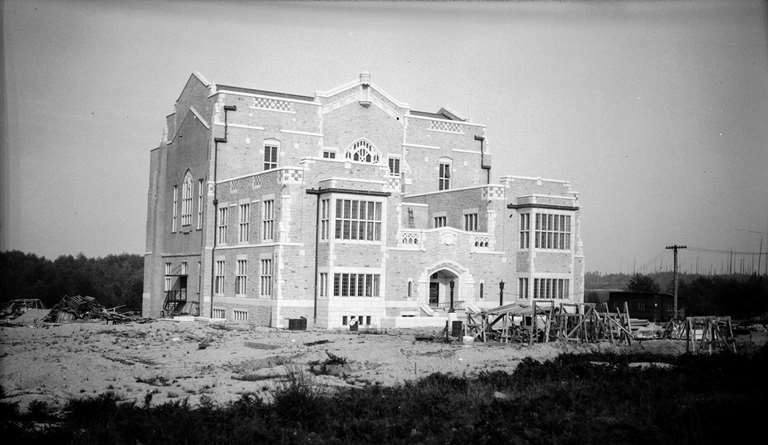 UBC’s Main Library – now Irving K. Barber Learning Centre – under construction in 1925. 1931: With the construction of West Vancouver’s British Properties, the British Pacific Properties syndicate offers to build a bridge from downtown to West Vancouver. Because the bridge would cut through Stanley Park, locals are furious with the decision, but the economic benefits outweigh the controversy. 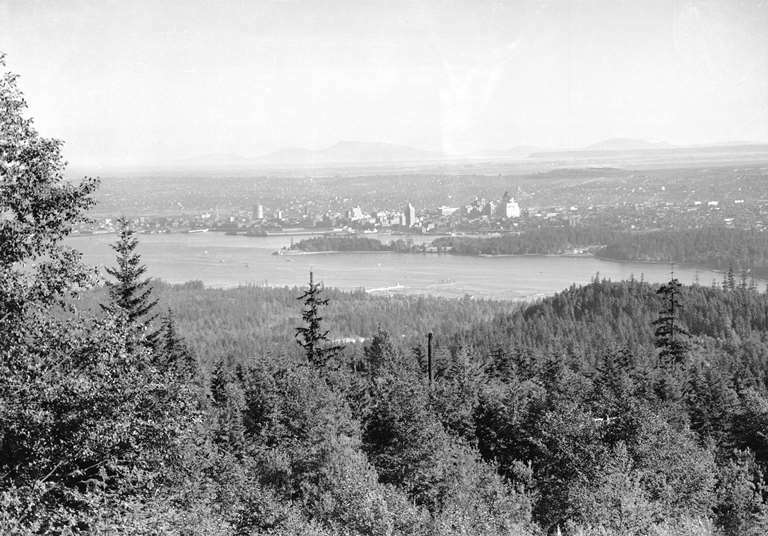 The view of Vancouver from West Vancouver’s British Properties in 1932. 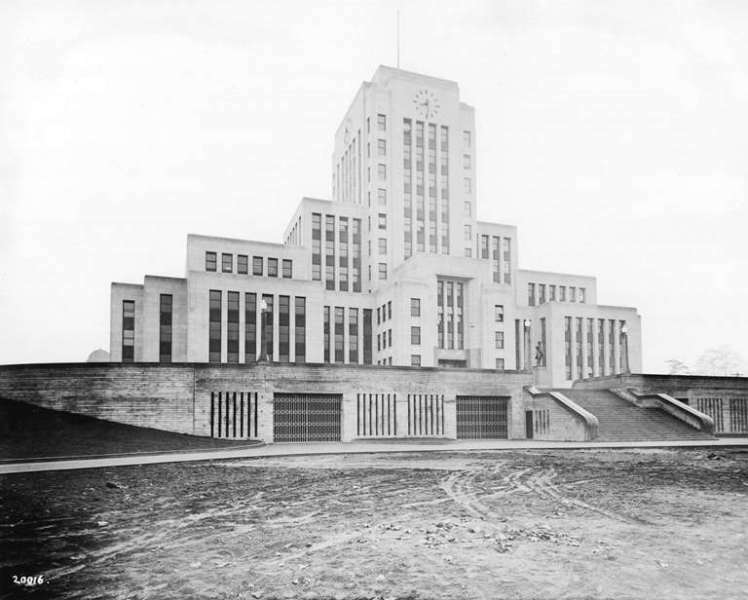 December 2, 1936: Vancouver’s City Hall opens at 12th and Cambie. The Art –Deco building cost $1 million to construct. Vancouver City Hall prior to opening in 1936. November 14, 1938: The Lions Gate Bridge, owned by the Guinness Beer family, officially opens at a cost of $6 million. Cars are tolled, starting at 25 cents per car, until 1963. 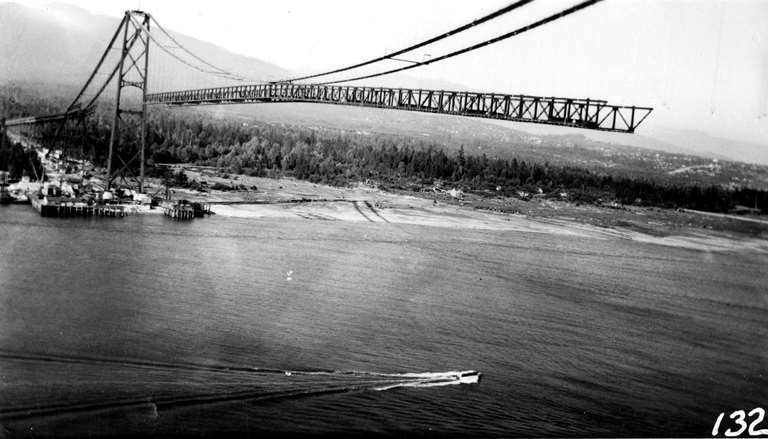 Lions Gate Bridge spans south from the North Shore while under construction in 1938. 1942: In the wake of the Pearl Harbour attack, Japanese-Canadians are forced into internment camps in Hastings Park and then moved to government camps in the province’s interior. In the process, they lose their property, jobs and businesses. The decision, implemented by the Federal government, is made in fear of a Japanese attack on Canada. 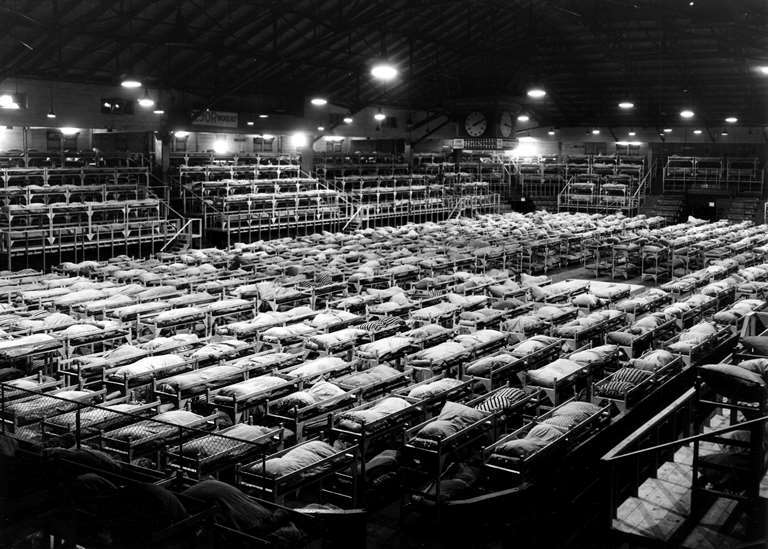 A men’s dormitory in the Forum building during Japanese Canadian internment and relocation. June 15, 1956: The Vancouver Aquarium opens as Canada’s first public aquarium and the first aquarium in the world to capture and display the orca whale. 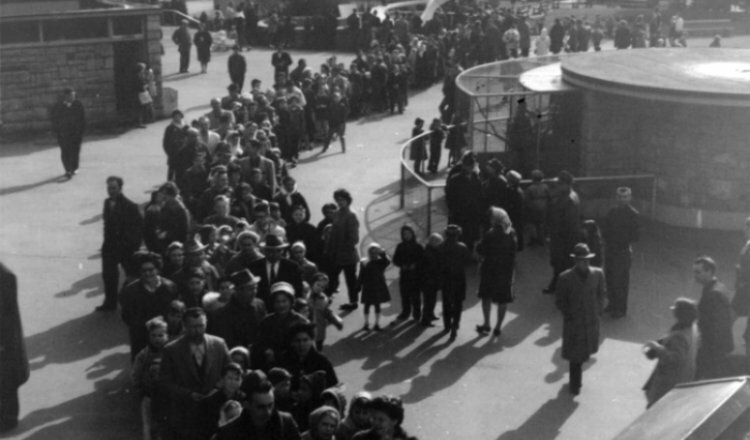 Guests line up outside the Aquarium on opening day in 1956. 1959: Oakridge Centre, the Queen Elizabeth Theatre, the Vancouver Maritime Museum and the George Massey Tunnel open. Miss P.N.E. 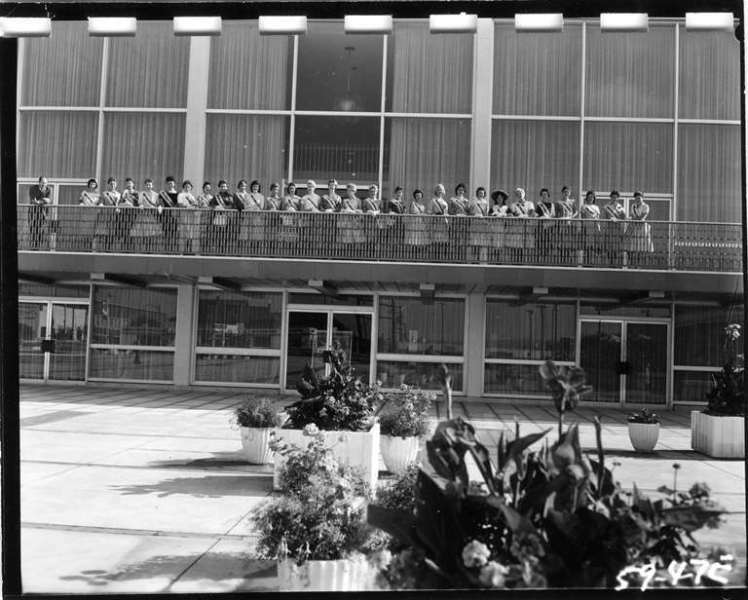 contestants pose for photos outside the brand-new Queen Elizabeth Theatre in 1959. 1961: Vancouver’s population reaches 800,000. 1966: Whistler Mountain opens to the public after being built with the intention of bidding for the 1968 Winter Olympics. 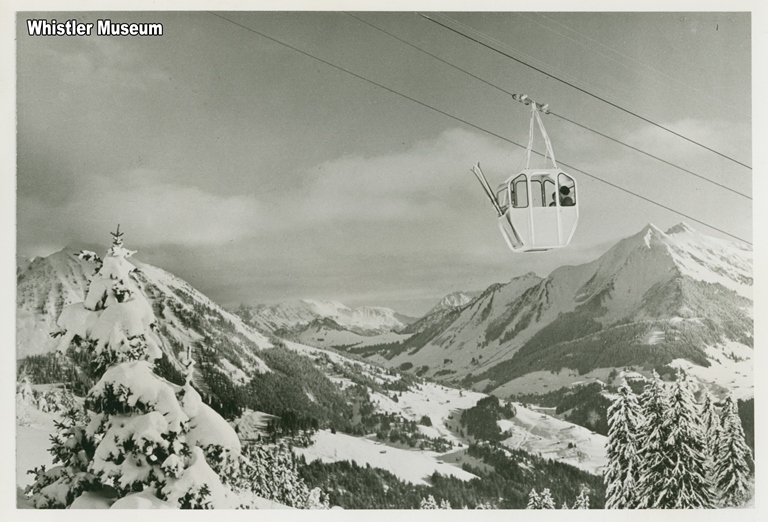 The Whistler Creekside gondola in 1966. 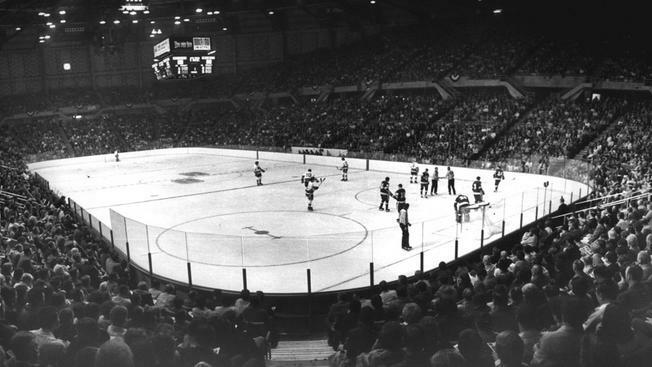 October 9, 1970: The Vancouver Canucks play their first game in the NHL against the Los Angeles Kings, losing 3-1. The Vancouver Canucks play their first ever game against the LA Kings at the Pacific Coliseum. August 7, 1971: The Gastown Riots occur following a crackdown by undercover drug squad members against the use of marijuana. Two thousand protestors begin a “Smoke-In” in Gastown and clash with police, resulting in 79 arrests. September 21, 1980: The Stanley Park Seawall is completed after over six decades of planning and construction. June 19, 1983: BC Place officially opens in preparation for the 1986 World’s Fair. The stadium is the world’s largest air-supported domed stadium until a new roof is installed decades later. The first ever event at BC Place occurs on June 20 with a match between the Vancouver Whitecaps and the Seattle Sounders. 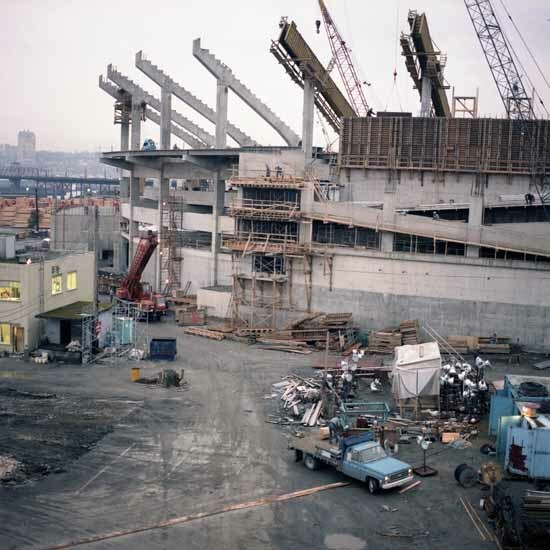 BC Place under construction in 1981. December 11, 1985: The SkyTrain begins operating from Waterfront Station to New Westminster Station in time for Expo ’86. 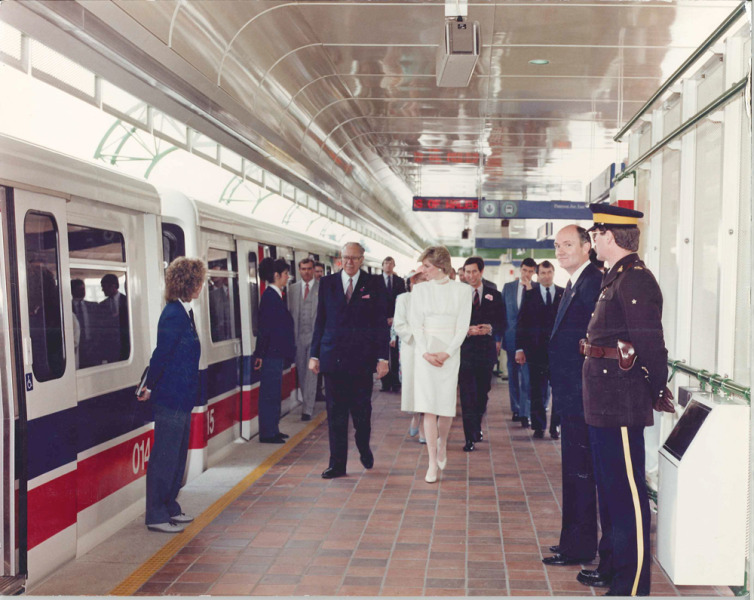 Princess Diana and Prince Charles visit the SkyTrain at Patterson Station in 1986. 1986: A big year for Vancouver. Expo ’86 brings over 22 million visitors to the “World in Motion – World in Touch” themed fair between May and October. Vancouver landmarks including BC Place Stadium, Canada Place, the Plaza of Nations and Expo Centre (now Science World) are all constructed as part of the event. 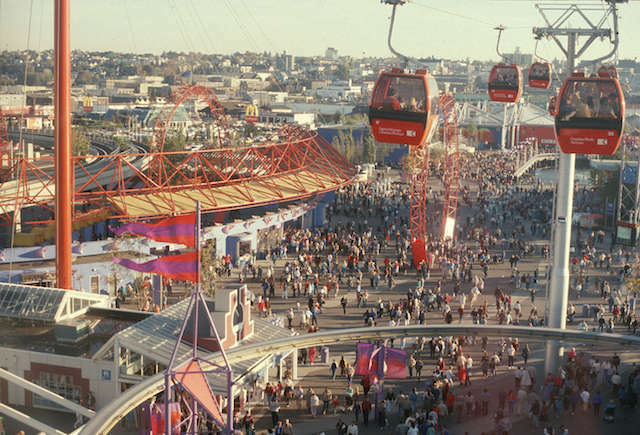 Expo ’86 also featured the world’s largest hockey stick, the McBarge, the world’s largest flag pole, a roller coaster, monorail and other impressive attractions. Prime Minister Brian Mulroney, Prince Charles and Princess Diana open the fair on May 2, 1986. Expo ’86 takes over False Creek with millions of visitors and brand new infrastructure, putting Vancouver into the world’s spotlight. June 14, 1994: The Vancouver Canucks face off against the New York Rangers in game seven of the Stanley Cup Finals. 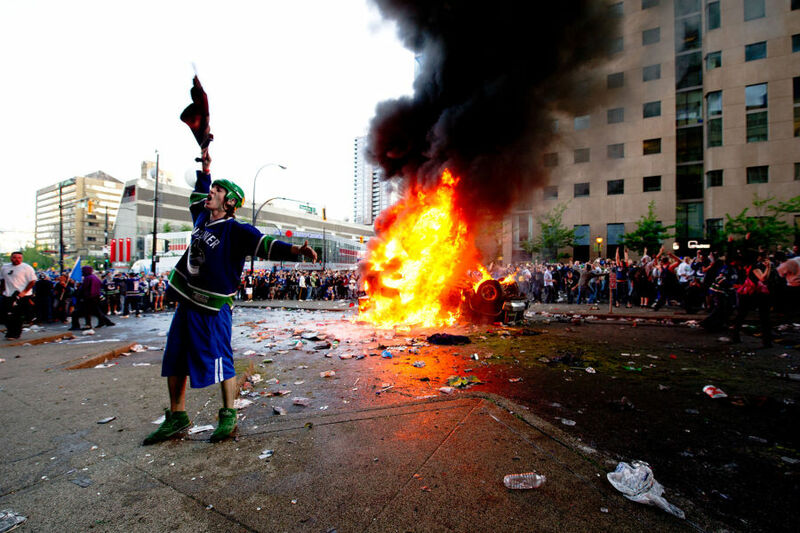 Unfortunately the team loses 2-3, causing riots in downtown Vancouver with up to 70,000 people and 540 police officers, resulting in $1.1 million worth of property damage and 200 injuries. 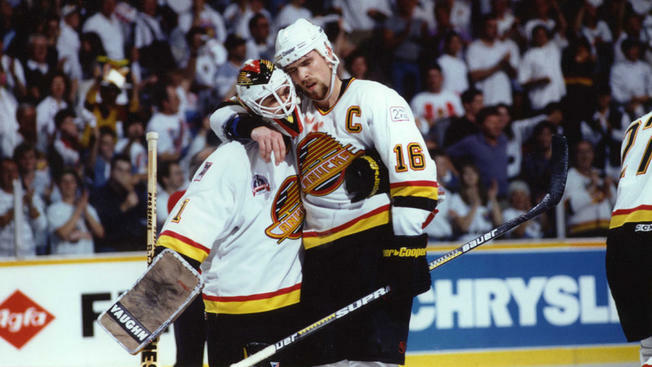 Trevor Linden hugs goalie Kirk McLean during the 1994 Stanley Cup Finals. May 26, 1995: The Vancouver Public Library Central Branch opens on Georgia Street as the largest capital project ever made by the City of Vancouver at a cost of $106.8 million. Inspired by Rome’s Colosseum, the design by DA Architects also features an outdoor ‘piazza’, an office tower and underground parking. 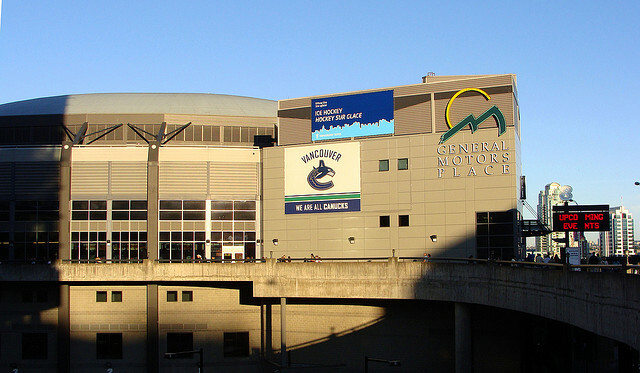 September 21, 1995: General Motors Place, now Rogers Arena, opens as the new home for the Vancouver Canucks and the Vancouver Grizzlies. GM Place, home of the Vancouver Canucks. 1995: The Vancouver Grizzlies, Canada’s second NBA team, are formed by Orca Bay Sports and Entertainment. They play out of General Motors Place until 2001 when the team is relocated to Memphis following dismal ticket sales. July 2, 2003: Vancouver wins the bid to host the 2010 Winter Olympic Games during an IOC session in Prague, beating out Salzburg, Austria and Pyeongchang, South Korea. 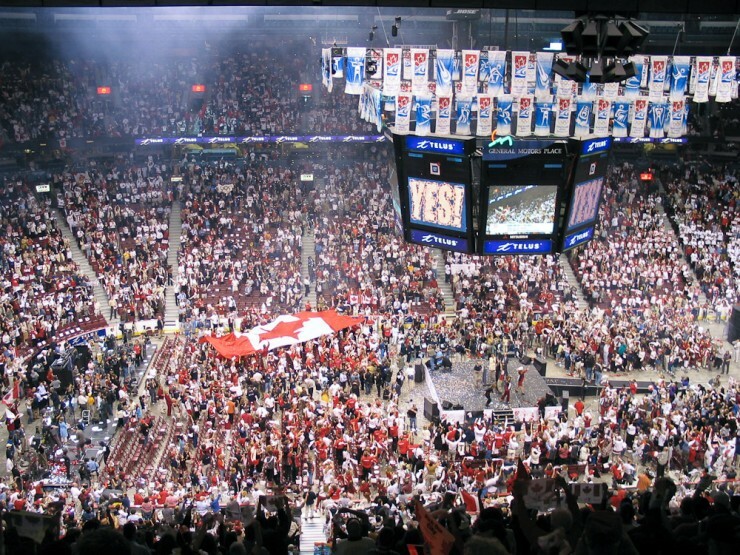 Crowds erupt inside GM Place when Vancouver is named the venue of the 2010 Winter Olympics. August 17, 2009: The Canada Line rapid transit system opens with transportation between Vancouver’s Waterfront Station and YVR, at first carrying 83,000 passengers per day in 2009 to a record of 228,000 per day during the 2010 Olympics. 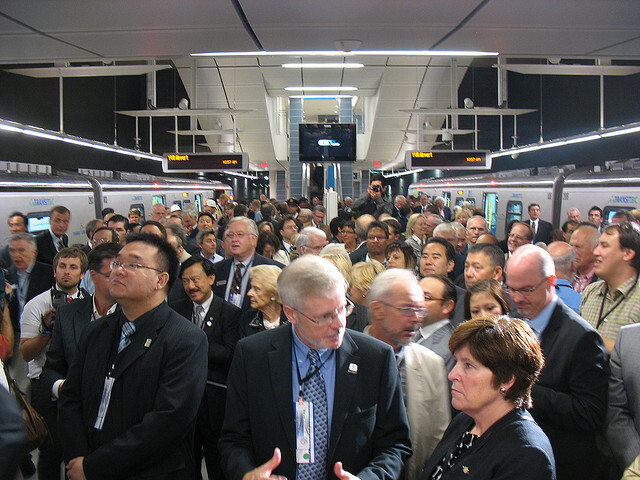 The Canada Line opens with a politician-filled opening ceremony. February 12, 2010: The 2010 Winter Olympics kick off in Vancouver with an elaborate Opening Ceremony for 60,000 people in BC Place. The two-week long event brings 2,566 athletes to Vancouver and Whistler and reaches billions of people worldwide. 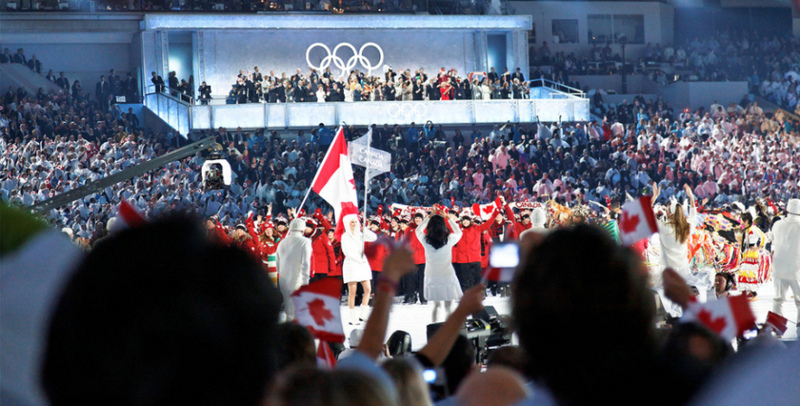 The 2010 Winter Olympics Opening Ceremony at BC Place. June 15, 2011: The Vancouver Canucks host the Boston Bruins at Rogers Arena for game seven of the Stanley Cup Finals, but lose the game 4-0. Meanwhile, the City had organized a two-block long viewing area on Georgia Street near the Arena with an estimated 100,000 people squeezing into the space. Near the end of the tragic loss, some fans begin vandalizing property, fighting and setting fires. A huge riot ensues until midnight, causing 140 injuries and $5 million in damages. Due to social media, pictures and videos of many of the rioters surface online, causing an unprecedented community involvement in the criminal prosecution of rioters. March 17, 2014: The annual TED Conference comes to Vancouver for the first time, bringing some of the world’s biggest influences, smartest people and richest business elite to the city. 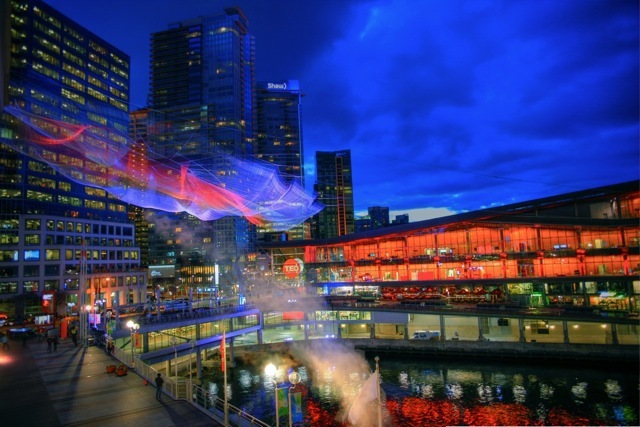 The TED Conference’s light installation outside the Vancouver Convention Centre illuminates the area.